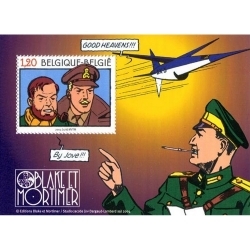 Stamp edited by the Belgian Post on the theme of Blake and Mortimer: The Secret of the Swordfish. 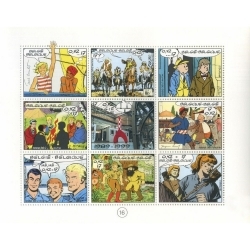 Board of 9 stamps edited by the Belgian Post and the Centre Belge de la Bande Dessinée on the theme of Franco-Belgian comics. 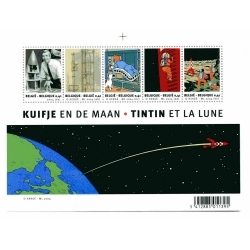 Authentic stamps edited by the Belgian Post on the occasion of the 10 years of the CBBD. Limited edition of 2500 copies. 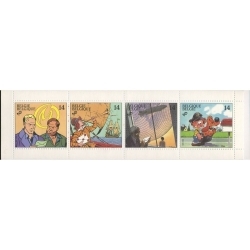 Board of 4 stamps edited by the Belgian Post on the theme of mail with Blake and Mortimer, Corentin, The Obscure Cities and Boule & Bill . Authentic stamps edited by the Belgian Post.